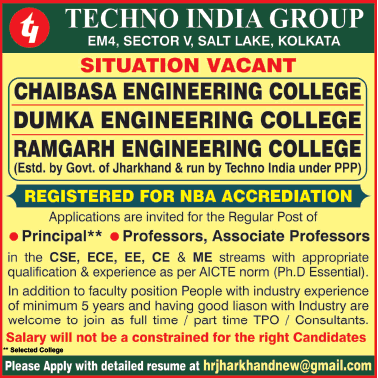 Chaibasa Engineering College, Kolkata has advertised in THE TIMES OF INDIA newspaper for recruitment of Principal / Professor / Associate Professor jobs vacancies. Interested and eligible job aspirants are requested to apply immediately from 30th January 2019. Check out further more details below. About College: Chaibasa Engineering College, (Estd. By Govt. of Jharkhand & run by Techno India Under PPP) is situated 12km north of Chaibasa town, District West Singhbhum, State Jharkhand. The College was started during 2013 in PPP model between Jharkhand Government and Techno India. At the beginning college started its journey as “Techno India Chaibasa”, which was renamed as Govt. Engineering College Chaibasa in 2014 by the order of Govt. of Jharkhand. Finally, in 2017 due to several complications institute was again renamed as Chaibasa engineering College.